House plans with a wrap-around porch provide a full width porch that continues around the sides of a home. They evoke a timeless country or farmhouse style that can’t be ignored. Victorian style house plans often include this feature adding a historical element to the architecture of this design that is still loved to this day. In addition to adding outdoor beauty to a home design, they become an outdoor retreat that allows neighbors to gather and socialize, or a place for the homeowners to spend quiet time in the company of nature. The Haverhill Lane Country Home has 2 bedrooms, 2 full baths and 1 half bath. 1076 Sq. Ft., Width 25'-6", Depth 41'-6"
The Lucy Hill Narrow Lot Home has 3 bedrooms, 3 full baths and 1 half bath. 2217 Sq. Ft., Width 24'-0", Depth 43'-0"
The Sophie Spring Acadian Home has 3 bedrooms, 2 full baths and 1 half bath. 1832 Sq. Ft., Width 63'-0", Depth 51'-0"
The Southern Comfort Luxury Home has 6 bedrooms, 6 full baths and 2 half baths. 9360 Sq. Ft., Width 117'-4", Depth 155'-6"
2248 Sq. Ft., Width 48'-0", Depth 57'-6"
The Joshlynn Country Home has 4 bedrooms, 1 full bath and 1 half bath. 1616 Sq. Ft., Width 32'-0", Depth 30'-0"
The Overlook Vacation Home has 4 bedrooms and 3 full baths. 2340 Sq. Ft., Width 44'-0", Depth 40'-4"
The Anson Isle Country Lake Home has 4 bedrooms and 3 full baths. 2413 Sq. Ft., Width 50'-0", Depth 44'-0"
The Pleasant Point Mountain Home has 3 bedrooms and 2 full baths. 1301 Sq. 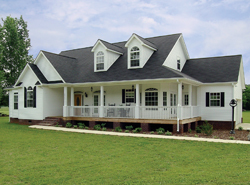 Ft., Width 28'-0", Depth 34'-0"
House Plans and More features many house plans with wrap-around porches. We offer detailed floor plans that allow the home buyer to envision their dream home easily, right down to the smallest detail. With a wide variety of home plans with a wrap-around porch, we are sure that you will find the perfect home design to fit your needs and lifestyle.